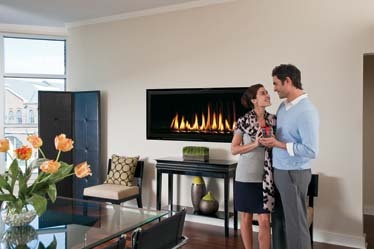 Large, vibrant Town & Country signature flames actively dance over the "invisible" burner of the new WideS54 See Thru and perfectly divide architectural space. The WS54 See Thru includes an entirely illuminated burner, adding dynamic injections of up-light through the luminous Diamond media and understated down - light over tranquil stone and sand. With Town & Country's unparalleled venting versatility, the WS54 See Thru can be placed nearly anywhere within a building - even 110' from an exterior wall - and in peninsula installations.